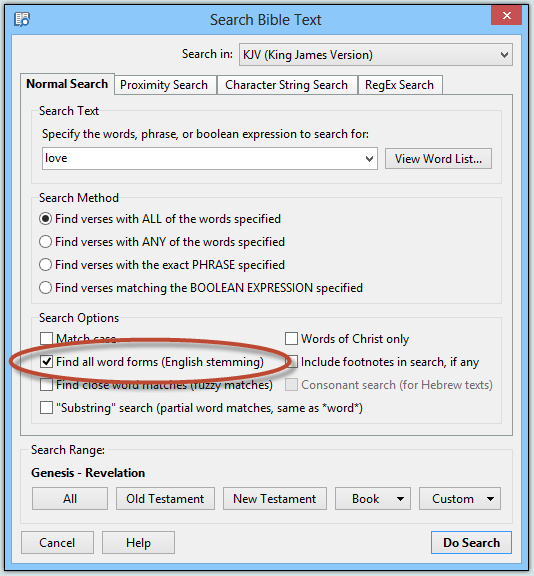 How to find verses with all word forms using Stemming. Often, when you need to find verses in the Bible, you need to look for more than just a single form of the word. For example, you may want to search for "love," but also want to find verses with other forms of the word, such a "loveth" and "loving." You could easily type in each form of the word, but that is not convenient and you may forget one. SwordSearcher provides a powerful searching function called English Stemming. When you use this, SwordSearcher will reduce words down to their base form (or stem), such as "love" for "loving" when doing comparisons for matches. This way, the software sees "love, loveth, loved, loving," etc., as all the same word and will include them in the search. You can further enhance your searches by combining the stemming token (=) with SwordSearcher's other advance searching functions, such as Boolean operations and fuzzy matching. SwordSearcher also allows English stem searching through commentaries and books (using the Full Library Search on the Search menu), in case you find the need to use this form of search in your reference material. 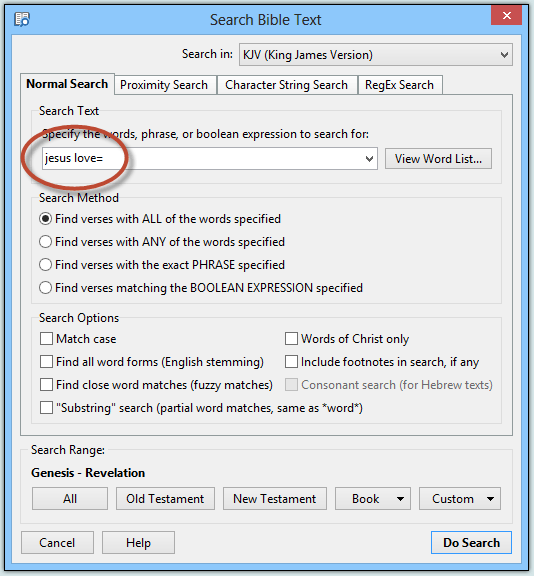 Read more about Bible Searching in SwordSearcher.